One of my favorite stories in the seerah is the story of Ka’ab Ibn Maalik (Radiyallahu anhu). It is one of those stories that many of us can relate to; it’s the kind of story that makes you realize that the sahaabah were human. They had certain personality quirk’s and character traits. They made mistakes. The sahaabah’s stories are retold to us in order for us to take lessons from, to be inspired by and most importantly to follow their path. Whenever I read the story of Ka’ab (Radiyallahu anhu), I walk away with a benefit, and for those of you who don’t know the story I have attached the following hadith that tells it. It’s a long hadith but worth the read. Abdullah bin Ka`b, who served as the guide of Ka`b bin Malik (May Allah be pleased with him) when he became blind, narrated: I heard Ka`b bin Malik (May Allah be pleased with him) narrating the story of his remaining behind instead of joining Messenger of Allah (sallallaahu ’alayhi wa sallam) when he left for the battle of Tabuk. Ka`b said: “I accompanied Messenger of Allah (sallallaahu ’alayhi wa sallam) in every expedition which he undertook excepting the battle of Tabuk and the battle of Badr. As for the battle of Badr, nobody was blamed for remaining behind as Messenger of Allah (sallallaahu ’alayhi wa sallam) and the Muslims, when they set out, had in mind only to intercept the caravan of the Quraish. Allah made them confront their enemies unexpectedly. I had the honour of being with Messenger of Allah (sallallaahu ’alayhi wa sallam) on the night of `Aqabah when we pledged our allegiance to Islam and it was dearer to me than participating in the battle of Badr, although Badr was more well-known among the people than that. And this is the account of my staying behind from the battle of Tabuk. I never had better means and more favorable circumstances than at the time of this expedition. And by Allah, I had never before possessed two riding-camels as I did during the time of this expedition. Whenever Messenger of Allah (sallallaahu ’alayhi wa sallam) decided to go on a campaign, he would not disclose his real destination till the last moment (of departure). But on this expedition, he set out in extremely hot weather; the journey was long and the terrain was waterless desert; and he had to face a strong army, so he informed the Muslims about the actual position so that they should make full preparation for the campaign. And the Muslims who accompanied Messenger of Allah (sallallaahu ’alayhi wa sallam) at that time were in large number but no proper record of them was maintained.” Ka`b (further) said: “Few were the persons who chose to remain absent believing that they could easily hide themselves (and thus remain undetected) unless Revelation from Allah, the Exalted, and Glorious (revealed relating to them). And Messenger of Allah (sallallaahu ’alayhi wa sallam) set out on this expedition when the fruit were ripe and their shade was sought. I had a weakness for them and it was during this season that Messenger of Allah (sallallaahu ’alayhi wa sallam) and the Muslims made preparations. I also would set out in the morning to make preparations along with them but would come back having done nothing and said to myself: ‘I have means enough (to make preparations) as soon as I like’. And I went on doing this (postponing my preparations) till the time of departure came and it was in the morning that Messenger of Allah (sallallaahu ’alayhi wa sallam) set out along with the Muslims, but I had made no preparations. I would go early in the morning and come back, but with no decision. I went on doing so until they (the Muslims) hastened and covered a good deal of distance. Then I wished to march on and join them. Would that I had done that! But perhaps it was not destined for me. After the departure of Messenger of Allah (sallallaahu ’alayhi wa sallam) whenever I went out, I was grieved to find no good example to follow but confirmed hypocrites or weak people whom Allah had exempted (from marching forth for Jihad). Messenger of Allah (sallallaahu ’alayhi wa sallam) made no mention of me until he reached Tabuk. While he was sitting with the people in Tabuk, he said,`What happened to Ka`b bin Malik?’A person from Banu Salimah said: “O Messenger of Allah, the (beauty) of his cloak and an appreciation of his finery have detained him.’ Upon this Mu`adh bin Jabal (MatAllah be pleased with him) admonished him and said to Messenger of Allah (sallallaahu ’alayhi wa sallam): “By Allah, we know nothing about him but good.’ Messenger of Allah (sallallaahu ’alayhi wa sallam), however, kept quiet. At that time he (the Prophet (sallallaahu ’alayhi wa sallam)) saw a person dressed in white and said,`Be Abu Khaithamah.’ And was Abu Khaithamah Al-Ansari was the person who had contributed a Sa` of dates and was ridiculed by the hypocrites.” Ka`b bin Malik further said: “When the news reached me that Messenger of Allah (sallallaahu ’alayhi wa sallam) was on his way back from Tabuk, I was greatly distressed. I thought of fabricating an excuse and asked myself how I would save myself from his anger the next day. In this connection, I sought the counsels of every prudent member of my family. When I was told that Messenger of Allah (sallallaahu ’alayhi wa sallam) was about to arrive, all the wicked ideas vanished (from my mind) and I came to the conclusion that nothing but the truth could save me. So I decided to tell him the truth. It was in the morning that Messenger of Allah (sallallaahu ’alayhi wa sallam) arrived in Al-Madinah. It was his habit that whenever he came back from a journey, he would first go to the mosque and perform two Rak`ah (of optional prayer) and would then sit with the people. When he sat, those who had remained behind him began to put forward their excuses and take an oath before him. They were more than eighty in number. Messenger of Allah (sallallaahu ’alayhi wa sallam) accepted their excuses on the very face of them and accepted their allegiance and sought forgiveness for them and left their insights to Allah, until I appeared before him. I greeted him and he smiled and there was a tinge of anger in that. He then said to me,’Come forward’. I went forward and I sat in front of him. He said to me,`What kept you back? Could you not afford to go in for a ride?’I said, ‘O Messenger of Allah, by Allah, if I were to sit before anybody else, a man of the world, I would have definitely saved myself from his anger on one pretext or the other and I have a gifted skill in argumentation, but, by Allah, I am fully aware that if I were to put forward before you a lame excuse to please you, Allah would definitely provoke your wrath upon me. In case, I speak the truth, you may be angry with me, but I hope that Allah would be pleased with me (and accept my repentance). By Allah, there is no valid excuse for me. By Allah, I never possessed so good means, and I never had such favourable conditions for me as I had when I stayed behind.’ Thereupon, Messenger of Allah (sallallaahu ’alayhi wa sallam) said,’This man spoke the truth, so get up (and wait) until Allah gives a decision about you.’I left and some people of Banu Salimah followed me. They said to me, `By Allah, we do not know that you committed a sin before. You, however, showed inability to put forward an excuse before Messenger of Allah (sallallaahu ’alayhi wa sallam) like those who stayed behind him. It would have been enough for the forgiveness of your sin that Messenger of Allah (sallallaahu ’alayhi wa sallam) would have sought forgiveness for you.’ By Allah, they kept on reproaching me until I thought of going back to Messenger of Allah (sallallaahu ’alayhi wa sallam) and retract my confession. Then I said to them, ‘Has anyone else met the same fate?’ They said, ‘Yes, two persons have met the same fate. They made the same statement as you did and the same verdict was delivered in their case.’ I asked, `Who are they?’ They said, ‘Murarah bin Ar-Rabi` Al-`Amri and Hilal bin Umaiyyah Al-Waqifi.’ They mentioned these two pious men who had taken part in the battle of Badr and there was an example for me in them. I was confirmed in my original resolve. Messenger of Allah (sallallaahu ’alayhi wa sallam) prohibited the Muslims to talk to the three of us from amongst those who had stayed behind. The people began to avoid us and their attitude towards us changed and it seemed as if the whole atmosphere had turned against us, and it was in fact the same atmosphere of which I was fully aware and in which I had lived (for a fairly long time). We spent fifty nights in this very state and my two friends confined themselves within their houses and spent (most of their) time weeping. As I was the youngest and the strongest, I would leave my house, attend the congregational Salat, move about in the bazaars, but none would speak to me. I would come to Messenger of Allah (sallallaahu ’alayhi wa sallam) as he sat amongst (people) after the Salat, greet him and would ask myself whether or not his lips moved in response to my greetings. Then I would perform Salat near him and look at him stealthily. When I finish my Salat, he would look at me and when I would cast a glance at him he would turn away his eyes from me. When the harsh treatment of the Muslims to me continued for a (considerable) length of time, I walked and I climbed upon the wall of the garden of Abu Qatadah, who was my cousin, and I had a great love for him. I greeted him but, by Allah, he did not answer to my greeting. I said to him, `O Abu Qatadah, I adjure you in the Name of Allah, are you not aware that I love Allah and His Messenger (sallallaahu ’alayhi wa sallam)?’ I asked him the same question again but he remained silent. I again adjured him, whereupon he said, `Allah and His Messenger (sallallaahu ’alayhi wa sallam) know better.’ My eyes were filled with tears, and I came back climbing down the wall. As I was walking in the bazaars of Al-Madinah, a man from the Syrian peasants, who had come to sell food grains in Al-Madinah, asked people to direct him to Ka`b bin Malik. People pointed towards me. He came to me and delivered a letter from the King of Ghassan, and as I was a scribe, I read that letter whose purport was: `It has been conveyed to us that your friend (the Prophet (sallallaahu ’alayhi wa sallam)) was treating you harshly. Allah has not created you for a place where you are to be degraded and where you cannot find your right place; so come to us and we shall receive you graciously.’ As I read that letter I said: ‘This is too a trial,’ so I put it to fire in an oven. When forty days had elapsed and Messenger of Allah (sallallaahu ’alayhi wa sallam) received no Revelation, there came to me a messenger of the Messenger of Allah and said, `Verily, Messenger of Allah (sallallaahu ’alayhi wa sallam) has commanded you to keep away from your wife.’ I said, `Should I divorce her or what else should I do?’ He said, `No, but only keep away from her and don’t have sexual contact with her.’ The same message was sent to my companions. So, I said to my wife: ‘You better go to your parents and stay there with them until Allah gives the decision in my case.’ The wife of Hilal bin Umaiyyah came to Messenger of Allah (sallallaahu ’alayhi wa sallam) and said: ‘O Messenger of Allah, Hilal bin Umaiyyah is a senile person and has no servant. Do you disapprove if I serve him?’ He said,`No, but don’t let him have any sexual contact with you.’ She said, ‘By Allah, he has no such desire left in him. By Allah, he has been in tears since (this calamity) struck him.’ Members of my family said to me, `You should have sought permission from Messenger of Allah (sallallaahu ’alayhi wa sallam) in regard to your wife. He has allowed the wife of Hilal bin Umaiyyah to serve him.’ I said, ‘I would not seek permission from Messenger of Allah (sallallaahu ’alayhi wa sallam) for I do not know what Messenger of Allah might say in response to that, as I am a young man’. It was in this state that I spent ten more nights and thus fifty days had passed since people boycotted us and gave up talking to us. After I had offered my Fajr prayer on the early morning of the fiftieth day of this boycott on the roof of one of our houses, and had sat in the very state which Allah described as: `The earth seemed constrained for me despite its vastness’, I heard the voice of a proclaimer from the peak of the hill Sal` shouting at the top of his voice: ‘O Ka`b bin Malik, rejoice.’ I fell down in prostration and came to know that there was (a message of) relief for me. Messenger of Allah (sallallaahu ’alayhi wa sallam) had informed the people about the acceptance of our repentance by Allah after he had offered the Fajr prayer. So the people went on to give us glad tidings and some of them went to my companions in order to give them the glad tidings. A man spurred his horse towards me (to give the good news), and another one from the tribe of Aslam came running for the same purpose and, as he approached the mount, I received the good news which reached me before the rider did. When the one whose voice I had heard came to me to congratulate me, I took off my garments and gave them to him for the good news he brought to me. By Allah, I possessed nothing else (in the form of clothes) except these garments, at that time. ‘Allah has forgiven the Prophet (sallallaahu ’alayhi wa sallam), the Muhajirun (Muslim Emigrants who left their homes and came to Al-Madinah) and the Ansar (Muslims of Al-Madinah) who followed him (Muhammad (sallallaahu ’alayhi wa sallam)) in the time of distress (Tabuk expedition), after the hearts of a party of them had nearly deviated (from the Right Path), but He accepted their repentance. Certainly, He is unto them full of kindness, Most Merciful. And (He did forgive also) the three who did not join [the Tabuk expedition and whose case was deferred (by the Prophet (sallallaahu ’alayhi wa sallam)) for Allah’s Decision] till for them the earth, vast as it is, was straitened and their ownselves were straitened to them, and they perceived that there is no fleeing from Allah, and no refuge but with Him. Then, He forgave them (accepted their repentance), that they might beg for His Pardon [repent (unto Him)]. Verily, Allah is the One Who forgives and accepts repentance, Most Merciful. O you who believe! Be afraid of Allah, and be with those who are true (in word and deeds).”(9:117,118). Ka`b further added: “The matter of the three of us remained pending for decision apart from the case of those who had made excuses on oath before Messenger of Allah (sallallaahu ’alayhi wa sallam) and he accepted those, took fresh oaths of allegiance from them and supplicated for their forgiveness. The Prophet (sallallaahu ’alayhi wa sallam) kept our matter pending till Allah decided it.The three whose matter was deferred have been shown mercy.The reference here is not to our staying back from the expedition but to his delaying our matter and keeping it pending beyond the matter of those who made their excuses on oath which he accepted”. The Story of Ka’ab teaches us not to underestimate the harmful effects procrastination can have on us. It can, in fact, rob us of so many opportunities to do good. Because Ka’ab (radiyallhu anhu) delayed making preparations, he missed out on the rewards of fighting for the sake of Allah. The story of Ka’ab also contain many valuable parenting lessons. In his youth, and his old age, Ka’ab provides a prime example to both children and parents on how we can deal with our mistakes. 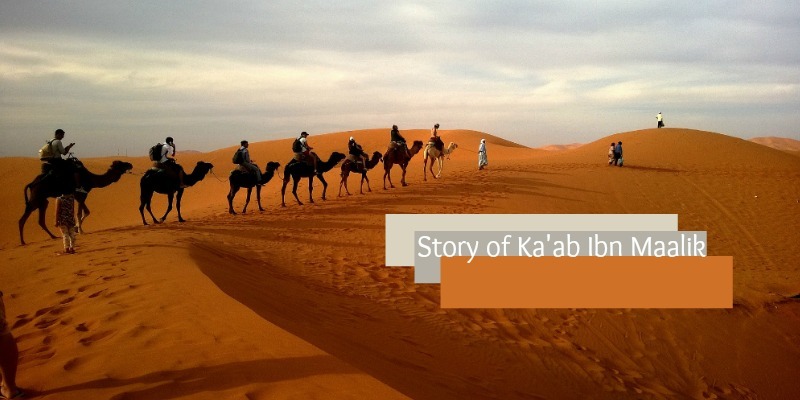 1: Ka’ab in his old age became a blind man, so his son, Abdullah took care of him. He related this story to his son, who later narrated it in a hadith. I found this remarkable for many reasons, and one of them being the fact that his father had enough courage to tell his son about a not so proud time in his life, when many others would have hidden it or at least not tell it in such detail. How many times have our parents told us something they not only regretted but were also ’embarrassed’ by? This shows us that as parents we should not shy away from telling our children about our mistakes, in order for them to learn from it. We are not perfect so sharing stories in a manner that is beneficial can really deliver a strong message. Take note that Ka’ab (radiyallhu anhu) was not bragging about his sin, but was instead full of regret. To be fair and to give his son a better understanding of how he was during his younger days, he made sure to start off by mentioning all the good and positive contributions he has done. This is important as it shows that no matter how good a person may be, he/she can still fall victim to Shaytan. 2: “By Allah, I am fully aware that if I were to put forward before you a lame excuse to please you, Allah would definitely provoke your wrath upon me. In case, I speak the truth, you may be angry with me, but I hope that Allah would be pleased with me”. As parents, we don’t want our children to lie to us or anyone else for that matter but sometimes we put them in compromising situations where they may tell a fib just to make us feel better. Even though we may tell our children to always be honest in order to please Allah as Allah loves those who are truthful, often times our actions send the message to our children that their priority should be to please us, first and foremost. Ka’ab (Radiyallahu anhu) could’ve easily made an excuse (like the hypocrites) to avoid punishment, but because it wasn’t the prophet (salalaahu alaihi wasallam) that he feared the most but Allah (S.W.T. ), he came clean, and faced the consequences of his actions. As much as Ka’ab (Radiyallahu anhu) loved the prophet (salalaahu alaihi wasallam), and wanted to please him, his love for Allah was greater. This goes to show the importance of teaching our children to seek Allah’s pleasure, and at the same time to fear Allah’s (S.W.T.) wrath above all else. 3: I am sure you have heard your fair share of these 3 words, “It’s not fair!” as your child screams and stomps their feet. During these moments, we can impart to our children the lessons learned from the part of the story, when the hypocrites lied to the prophet (salalaahu alaihi wasallam). Although he (s.a.w.) had no choice but to accept it from them and it seemed like they averted punishment, they in actuality only delayed it. While the three who told the truth (one of whom was Ka’ab) got their punishment (of being boycotted) and were later forgiven, the hypocrites will have to await the punishment of the hereafter. The lesson we can teach our children about this is that although sometimes things may not seem fair, Allah (s.w.t) is just and takes everything into account. Being punished in this world which is temporary is far better than being punished eternally in the hereafter. JazakAllah so much for posting this. It was really nice. I never really thought about how much we could learn from this Hadith. Wa iyaaki, sis. There are always lessons to be learned especially from students of knowledge and the Ulamaa.